Many Trados users complain that it is impossible to use most Trados keyboard shortcuts when working on a laptop. Using the mouse to click on the toolbar icons feels awkward to people accustomed to touch type, and trying to activate the keyboard shortcuts through the virtual keypad accessed via the Fn key often ends up as an exercise in frustration. A simple (and cheap) solution is to buy an USB numeric keypad: mine cost only a few dollars, is very lightweight and is also useful when working on a spreadsheet or entering numbers. It may also help those of us accustomed to enter accented characters via the Alt+number route. 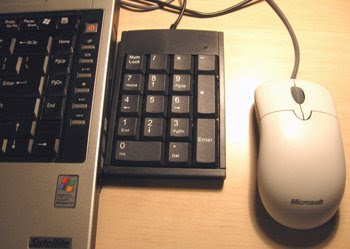 If you use an USB keypad like this, however, you may have to experiment a bit: on my computer, for example, the Alt+number accented characters only appeared after hitting the backspace key. This may differ on different laptops. Another option would be to remap the shortcuts through word macros (if you use workbench) or AutoHotkey or any macro recorder (if you use Tageditor for instance). I use Alt+ "W" to get to the next segment (that would be Alt + "Z" if youre not using a French keyboard). That's easier to type than Alt + "+" and frees my right hand to use the mouse or hold a cup of tea if I'm just proofreading segments. I thought you were going to suggest a punchbag as a useful tool for Trados users..! Another solution for TagEditor (the one I followed, since I don't want to carry an extra keypad around) is to remap the keyboard combination in the TagEditor resources using a resource editor. I did this with Resource Hacker. Always make a backup of the files before you tweak them. Quit TagEditor. Open the "TagEditor1033.lng" (for English. I think "TagEditor1034.lng" is for Spanish etc.). This file is normally located in \SDL International\T2007_FL\TT\Lng. In the resource editor, go to Accelerators>109>1033. Look for the hotkey you want to change, for instance Alt-Home is listed as "K_HOME, 32769, NOINVERT, ALT, VIRTKEY". Supposing I want to change the hotkey to Alt-1, I will need to change the above line to "VK_1, 32769, NOINVERT, ALT, VIRTKEY". Then press "Compile Script" at the top and choose File > Save. Now open TagEditor and the new hotkey for "Open/Get" will be Alt-1 as specified. If you want to go one step further, you can change the menu visualization by editing the resource in Menu>248>1033 so that the correct hotkey will be shown in the "Workbench" menu. This avoids confusion and allows the user to have a reference for the modified hotkeys. What's nice about this method, in my opinion, is that it's free, requires no software installations and can be replicated to any number of PC's by just copying one single tiny file. Another solution may be not using Trados, but any of the different options available which prove to be more productive. Why do you need such additional tools. There are simple shortcuts that work on any machine. oooooh, you just made my day!!! thousand times better than the lousy USB numeric keypad!! !